I'd like to automatically defragment my hard disk periodically so I just don't have to worry about it any more. 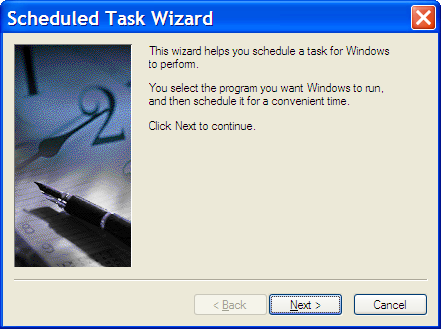 I've heard of the Windows Task Scheduler, can I use that? Yes you can. In fact, I do. OK, I run a lot of things in the middle of the night, but periodic defragging is one of them. 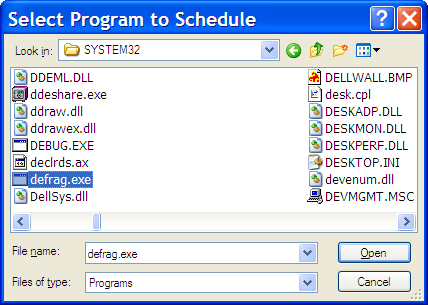 We'll set up the command line version of the defragmenting tool defrag.exe to run once a week. I'll arbitrarily pick 3 AM on Sunday mornings, but you can naturally set your own schedule. 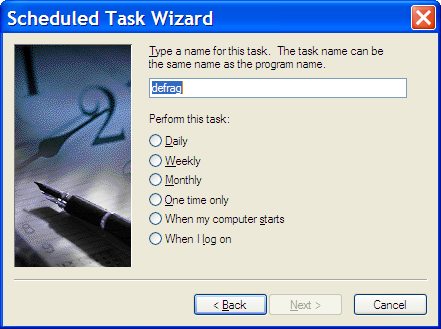 Starting in Control Panel, double click on Scheduled Tasks. 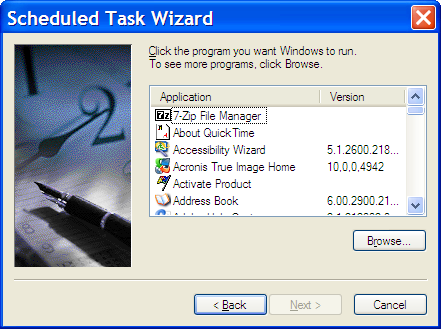 Then double click on Add a Scheduled Task. As I indicated, I've selected 3AM every Sunday. Click Next. 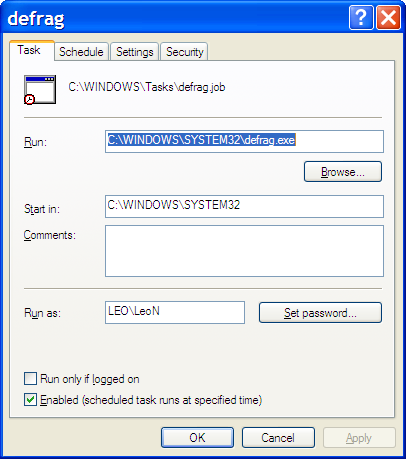 Each scheduled task is run as if it were a separate login to your machine, so at this point you'll need to enter a login account and password that the system should use to run the task. And you're done! Click Finish, and the task will now run automatically every Sunday at 3AM. Now, there's a problem with what we've done so far: there's no log of the results. Defrag might run, but any messages it might output are lost. Unfortunately there's no built-in solution, but that doesn't stop us. That command file runs defrag.exe and saves all normal and error output to the file "c:\defrag.log". Try it. 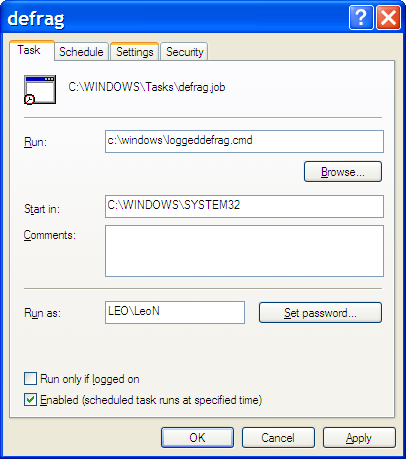 You can run "loggeddefrag" in a Windows Command Prompt, and when it completes you can have a look a the log it creates. Now we just need to update our scheduled task. 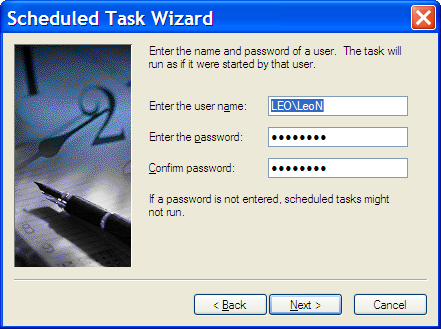 Press OK, and you'll have to re-enter the password for the account that will be used to run the scheduled task. Now you're really done. Check that log file each Sunday morning and you'll see that the defragmenter has run as well as any errors it might have encountered along the way. How do I defragment my new hard disk? Defragmenting is a useful bit of maintenance to keep your hard disks speedy. It's not always needed, though. We'll look at when, and how, to defrag. One of the cool aspects of Windows Vista: this is a default behavior. Once a week the disk defragger will kick off - 4:00 a.m. on Sunday morning. The only drawback: the cute progress window (showing the fragmentation as the tool ran) has been eliminated in Vista... nothing to watch! If you like metrics, you can run defrag at the command prompt with the -a -v options. 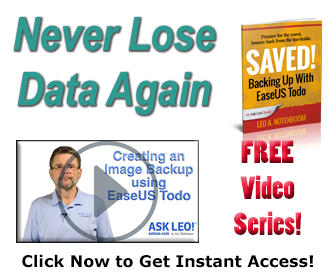 The Vista version uses fewer system resources and will operate with a drive that is nearly full. Previous versions required 15 to 20 percent empty space on the disk. I have wanting to do this for awhile. The problem is I am running windows 2000 and when I click on "program files" there is no "system 32". Do these instruction work with windows 2000? What a convoluted way to schedule the Windows defragmenter which in my opinon as an archaic piece of software. I recommend that you ourchase the latest Diskeeper 2007 from www.diskeeper.com You can try it for 30 days before buying. I followed directions to add the frag log to the running of the defrag routine. It was put into the schedule to run in the early am on Monday (yesterday). When the log was not created, I started investigating. I tried to run defrag from the run box in my XP Service Pack 2 system. The black box flashed momentarily and then vanished. This happened two or three times. I then ran the defrag routine that is a part of system tools and that said I didn't need to run it, but I did anyway; it took maybe an hour, and then finished fine. Every since service pack 2 certain things I have tried have acted like that: the black run box starting and then quitting without any messages or indications. I suspect there is a fundamental problem with the OS caused by service pack 2, but have no way of knowing what it is and of course of being able to correct it. Is this something that you could address? Follow up to previous query about defrag. Re: your article on "When I use start-run and type in a command, why does a window just flash and disappear?" Which is what was happening to me. So I followed your directions, using cmd and the window did not disappear. Then when I put in the defrag command exactly as you have it. I get the message: "access is denied". When I followed the steps above it never asked for any password. I'm the only one using my machine. Wow, incredible astroturfing from the people at Diskeeper. Could you make more obviously biased comment spam? Not a chance I'd ever try, let alone buy, your product now (and most of your comments are wrong). Diskeeper: either your sales policy is sleazy or an individual there is. I think the reason it flashes up and disappears again is 'cause it isn't running. It requires for you to specify the drive after typing in defrag. This is not specified. I changed the loggeddefrag file to "defrag c: >c:\defrag.log 2>&1" but it still didn't seem to work. Can anyone advise me? "Wow, incredible astroturfing from the people at Diskeeper. Could you make more obviously biased comment spam? Not a chance I'd ever try, let alone buy, your product now (and most of your comments are wrong). Diskeeper: either your sales policy is sleazy or an individual there is. Posted by: Troy at June 5, 2007 07:02 PM"
Of course you do realise when you state "Not a chance I'd ever try, let alone buy, your product now" that the Windows defrag routine is a cut-down version of Diskeeper. Let us know how you get on with the uninstall. I tried to do this, and it says I do not have permission to set the scheduled task, what do I do? Defrag runs, but stops when it determines defrag is not needed, and waits for user input. Disk cleanup does the same. How do I get the programs to continue without user input? Let me know if you have instructions for Vista, etc. There were some previous comments to recommend Diskeeper. Diskeeper is an excellent product... on the workstation but has serous misgivings on a Server ! I have found Diskeeper on the server to create problems on our Database servers and email servers. Basically Diskeeper on the server creates timing problems when opening files, that create errors in both our Pervasive SQL database and our Mercury/32 email server. We had to uninstall Diskeeper to keep those two programs running smoothly. We have a similar issue with Undelete (similar product from Diskeeper), that creates timing issues, but so far we have been able to work around it by specifying exactly which files we want to monitor for deletion and which we do not. Kind of a pain, but there product has saved us from grief which is the only reason why its still installed. Les Elton, Network Admin., ABC Recycling Ltd.
Don't worry, Vista automatically defrags every week. The %* will allow the cmd file to pick up command line options when executed. When you use defrag from the command line you always have to specify the target drive. I want to set up my xp pro machine to do automatic periodic defrag, but my machine is not on all the time. I do not see a check box for "run task if missed" will this happen automatically? Thanks! Windows XP says I should run de-frag (I did not have it scheduled, only now see your recommendation). But then says I only have 7% space available and should have 15%, do I want to continue? What will most likely happen if I try to run defrag in this case? It may take a little longer than normal, and not all files will neccessarily defrag. try defraggler (http://www.piriform.com/defraggler) - freeware that WORKS !! command C:\WINDOWS\system32\defrag.exe c: is only for C drive. How about command on how to defrag drive c:, d: e:? Please advice. Thanks. This newer article has a picture of Defrag in Task Scheduler: How often should I defragment my hard disk? - You might also want to read this article: Why didn't you answer my question? Very good and detailed directions -- my compliments! The only downside to using the built-in is that you need to leave your computer on all night (now-a-days not the best thing to do as it wastes energy), so you should select a time when you won't be using your computer for a while (manual defrags can take several hours depending on the size of the disk and the computer can't really be used for much while defragging). I would recommend a commercial defrag solution that operates in the background without using vital system resources so you don't have to interrupt your computer use. Really, the built-in defrag program is more meant for casual use, sort of like Word Pad or Paint -- fine for occasional use, but if you need to write a thesis or design some graphics for pro use, you would use Word for the thesis and maybe In-Design for the graphics, right? Likewise if you are a power user, consider a good commercial defrag program. I followed your instructions to the letter & was ok except when I had finished, it said I didn't have permission do do this task, I am the owner of the machine, (desktop) How do I get it to recognise me? I've not had this problem before.